The Lilacs have really been putting in a show this spring. They started blooming quite a bit later because of the cool temperatures. The flowers have been looking fresh longer too. Lilacs have been flowering profusely this spring. Some of the early varieties have started to fade, but the later varieties are still looking fine. A big bouquet of Lilacs can really brighten up a room. Also, cutting flower stems is just about the best kind of pruning you can do for your Lilac bush. Cut off as many stems as you need; you won’t hurt the plant. Keep your flowers fresh by stripping off the leaves from the stem. Also crush the base of the stems before placing them into water. A pair of pliers works well for small stems; use a small hammer for larger stems. It’s a very good idea to snip off all of the old flowers once your Lilac has finished blooming. Removing all the faded flowers will help stimulate the plant to produce even more flowers next year. The old flowers never fall off, they end up forming brown panicles that makes the shrub look a bit messy. So, that is another good reason to remove them. Don’t worry if you are not able to get to snipping off the flowers, your Lilac will still do just fine without any attention. That is another reason why Lilacs have been so popular since colonial times. There is also a discussion on crushing Lilac stems here. Sometimes it’s hard to decide how much to plant. How many seeds do you plant to get the amount of vegetables you need at harvest time? Maybe you have decided to make pickles this year; how much do you plant? Here is a chart I found in my old files. It was developed by Michigan State University in 1974. I referred to it all time back then, as you can see by all the markings on it. This chart was designed for a garden that will be planted in rows; raised beds and/or grid planting will produce different yields. 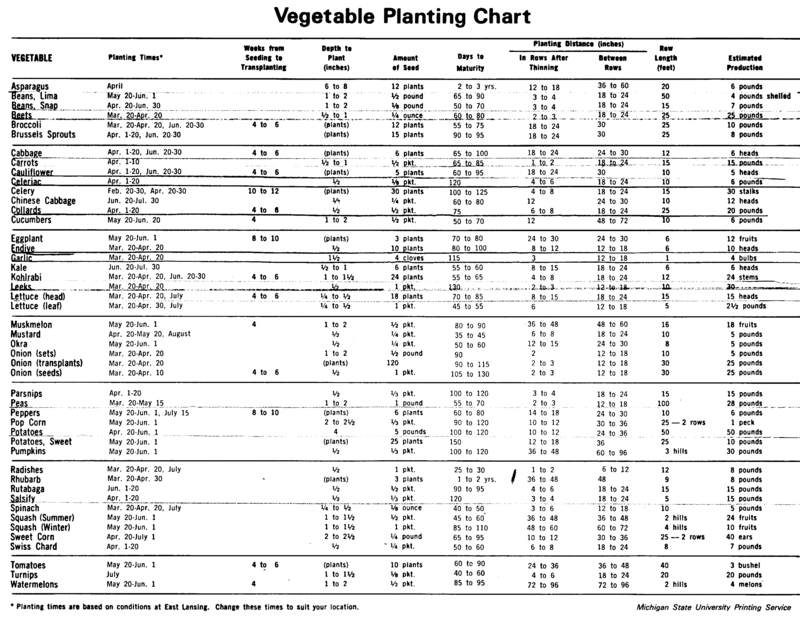 Use this chart as a reference point to decide planting and harvest rates. This chart is pretty old but I believe the information is still pretty accurate. There is a possibility of frost in our area tonight. That’s not surprising considering the cool spring we’ve had so far. I doubt if many gardeners have tender plants set out yet. The good news is: every day that goes by brings us closer to the frost free date. The National Weather Service has weather stations all over the State. They have figured out when the last chance of frost will be for all of those areas. Here a link to a chart they put together. It’s very interesting to see how wide the spread in temperatures is; even at neighboring stations. We have a lot of plants still in trays; a lot of them still have to be transplanted into bigger cells and pots. I plan to move them inside this evening. Many of these plants won’t be able to survive freezing temperatures. Much of our garden is under water. You can see the mulch under the water where the potatoes grew last year. Last year’s mulch where the potatoes grew. It looks like we may not be able to work that area until Memorial Day. That’s OK though since we can change our original plan and plant the warm weather crops into that area later on. I was really hoping to expand the garden further to the north this spring, but that will have to wait. Along with some moisture tolerant weeds, a clump of Yellow Iris is the only thing thriving. These Irises were started from seed a few years ago. I’m not sure exactly what species this is. It very well may be the species that has been causing trouble in other states by becoming invasive. Here in our garden it is behaving itself. The clump has slowly grown in size from four small plants to a clump about three feet in diameter. This clump of Iris is thriving in the flooded part of our garden. They’ll put on a nice of flowers for us a little later in the season. I’ll post some photos later when they blossom. I’ll also get a chance to identify them to see what variety they are while they are in bloom.